On December 6, 2017, the EPA hosted a day-long meeting "Progress Implementing Changes to the New Chemicals Review Program under the Amended TSCA". I (Darren Williams) listened via Webinar and captured most of the discussion transcript. I have gathered all the meeting materials, discussion transcripts, and public comments into one hyperlinked pdf file for your convenience. The individual documents are available from the EPA site. On December 11, 2017, the EPA hosted a second day-long meeting "Possible Approaches for Identifying Potential Candidates for Prioritization for Risk Evaluation Under Amended TSCA". I was not able to listen to this meeting. However, I gathered all the meeting materials and documents into one hyperlinked pdf file for your convenience. The individual documents are available at the EPA site. Here is a pdf version of our Poster presented at the ASETSDefense Workshop 2016. Look at the back of any can of paint, adhesive, or sealant and you will find that "Surface preparation is the most important step to ensure optimum performance of the coating." While there are many methods for testing the condition of the surface, few are as portable, versatile, and compact as the sessile drop. Typically, one places a 5 to 15 microliter drop of deionized water on the surface and analyzes the drop shape to determine the contact angle that the edge of the drop makes with the surface. With this information, one can take advantage of the wealth of literature and patents that correlate contact angle with surface properties. Solubility of explosives and polymer binders is a major factor in the formulation, recrystallization, and in demilitarization processes. Solvents, co-solvents, and non-solvents are used to form molding powders, to change particle size distributions, and to separate HE from its binder. Since these activities are not new endeavors, there are well-established processes and process fluids. However, the area of solubility is active for many reasons. There is a constant push to reduce or eliminate the use of toxic solvents with more benign alternatives. There is also a mandate to eliminate ozone-depleting solvents. And lastly, there are efforts to remove solvents from the process stream that leave behind corrosion-promoting chlorides. The paint and polymer industries have led the way in solvent substitution and solvent blend prediction activities. In particular, the Hansen solubility parameters (HSPs) have proven themselves and are described in detail in the literature. The HSPs may be used to qualitatively rank solvents and blends in terms of their interaction with a given solute. Solutes and solvents that have similar HSPs are predicted to mix spontaneously. Conversely, if the HSPs are drastically different between solute and solvent, then there will be little interaction and limited mixing. Dr. Williams group is capable of determining the Hansen solubility parameters for a solute, a surface, or a solvent and a papers related to these activities is found here. Williams, D. L.*; Kuklenz, K. D. A Determination of the Hansen Solubility Parameters of Hexanitrostilbene (HNS), Propellants Explosives and Pyrotechnics, 34, 452-457, (2009). The HNS paper was our first foray into determining the HSPs for a solute, and our methods have improved greatly since then. Unfortunately, much of our work in recent years has been under private contract and has not been published in public venues. Several group additivity methods have been developed to build up the Hansen solubility parameters from the various constituent chemical groups present in a solute. In an effort to produce a universal method, the developers of group additivity methods must include every possible chemical group that represents all bonding types. In an effort to increase the accuracy of these methods, the developers have introduced secondary structure arrangements. The drive towards universality has led to multiple ways to build a given solute, and non-obvious priority is given to certain bonding types and secondary structures. Computational chemistry programs are now available to almost all chemical researchers, and these programs have delivered the universal ability to model solutes that the group additivity methods have sought to achieve. Dr. Williams is researching a new approach wherein a quantitative structure property relationship (QSPR) is developed that converts the structural parameters from a computational chemistry output file into the HSPs for the solute. This work was presented in 2009 at the ICT Faunhofer conference on energetic materials. The need to replace a particular solvent a difficult task. One desires a replacement solvent that matches the desirable characteristics and avoids the undesirable characteristics. There may not be a single solvent that is a suitable replacement, and one must begin exploring blended solvents. Typically, solvent blends are explored via trial and error, but this is not an efficient method. The Hansen solubility parameters offer a guide to solvent blend selection. 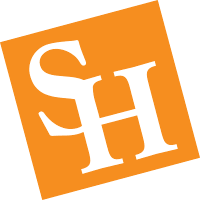 Dr. Williams and Dr. Loft at SHSU have developed software that takes a large list of solvents, and predicts the 2-, 3-, and 4-component blends that target the HSPs of a particular solute. 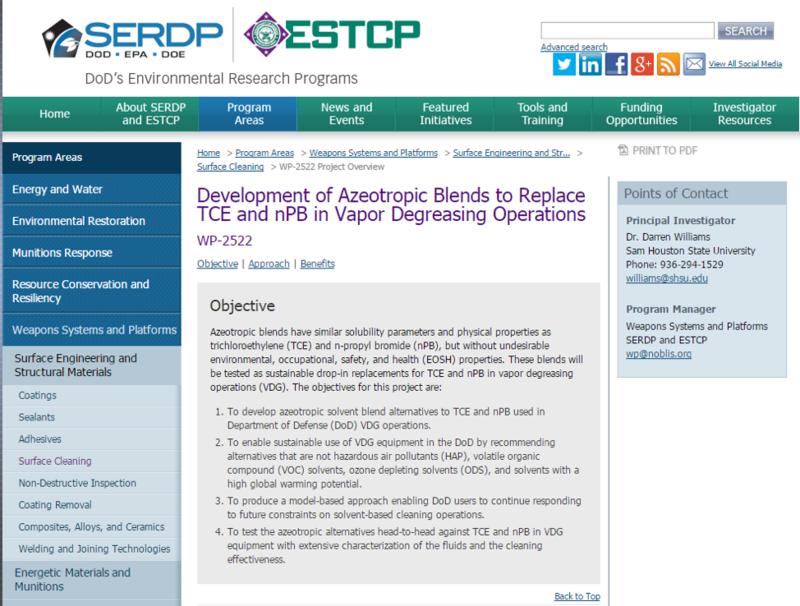 Several presentations and papers have been published outlining the solvent blend prediction procedures used by the Williams group. The most recent overview is given here. Williams, D. L. (Invited) Solving the Solvent Substitution Puzzle, Controlled Environments Magazine, 16(8), 10-14, (2013). Highly crosslinked polymeric materials do not typically dissolve, but they do swell in particular solvents. This is desirable if the goal is to remove these materials. However, if one does not want the polymeric material or coating to change or swell, then this test represents a chemical compatibility test. Dr. Williams is interested in adhesive removal. The swell testing results in identification of the HSPs of the polymeric material, and solvent blends are predicted for removing the adhesives and residues from glass and metal surfaces. Once a particular adhesive or contaminant is removed from a metal or glass surface, water is used as a probe of the surface energy. If all of the organic contamination has been removed, then the contact angle of a water drop will be low (20° - 30°). But what about the advancements in contact angle measurement? Is there an inexpensive way to enter this field, and how do I know if I have learned the technique? Williams, D. L.*; Kuhn, A. T.; Amann, M. A.; Hausinger, M. B.; Konarik, M. M.; Nesselrode, E. I. Computerized Measurement of Contact Angles, Galvanotechnik, 101(11), 2502-2512, (2010). Williams, D. L.*; Kuhn, A. T.; O'Bryon, T. M.; Konarik, M. M.; Huskey, J. E., Contact Angle Measurements Using Cellphone Cameras to Implement the Bikerman Method, Galvanotechnik, 102(8), 1718-1725, (2011). Williams, D. L.* and O’Bryon, T. M. (Invited) Cleanliness Verification on Large Surfaces – Instilling Confidence in Contact Angle Techniques, Chapter 5, in Rajiv Kohli & K. L. Mittal (Eds. ), Developments in Surface Contamination and Cleaning, vol. 6, Elsevier/William Andrew, Norwich, NY, (2013), pp 163 – 181. A temperature-controlled digital hydrometer / Du Nouy ring tensiometer was constructed in the Williams lab to measure the surface and interfacial tension of solvents and solvent blends used in the filled-polymer formulation process. It has also been used to measure the surface tension during the curing process of Sylgard elastomeric polymer. The details of this "home-built" instrument are available here. Williams, D. L.*, Jupe C. L., Kuklenz K. D., Flaherty T. J., An Inexpensive, Digital Instrument for Surface Tension, Interfacial Tension, and Density Determination, Industrial & Engineering Chemistry Research, 47(12), 4286-4289, (2008).